Time to call sophisticated London musician Martyn Ware. With partner Vince Clarke, he leads Illustrious, a squad of electronics and harmonics gurus who transform urban spaces – plazas, intersections, courts, bridges and parks around the world – via a new hybrid art known as 3D soundscaping. 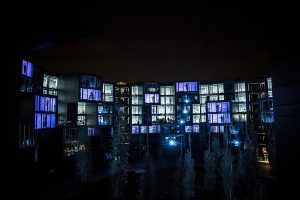 A brilliant example of this emerging creative discipline is the soundscape that Ware’s team created for a midsummer evening’s entertainment at the Tietgen student housing complex in Ørestad, near Copenhagen. 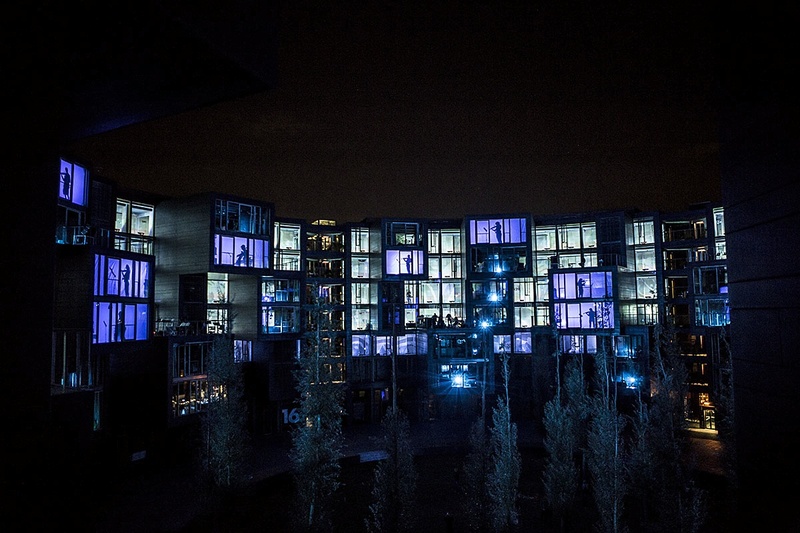 Performed for 2000 people during the Strom Music Festival in August 2013, their Panorama performance integrated a live 40-piece orchestra and studio-recorded music; with 16 channels of sounds mixed onsite and synced to coloured LED lights that illuminated the building windows like giant pixels. Emphasising the audio-visual theatrics was the syncopated rhythm of the architecture. The Tietgenkollegiet (by Lundgaard and Tranberg, 2006) is a visually exciting doughnut stack of projecting and receding boxes (in timber and glass, with steel supporting the balconies, vertical claddings and cantilevered floor slabs). Catch the whole event on video here. For most outdoor gigs, Illustrious uses custom mixing software (3Daudioscape.org) to visually program the sounds and locations of up to 16 speakers. This allows more precise and complex effects than quadrophonic or surround sound (using four or eight speakers arranged at one height around the sweet spot), and improves on the more recent ambisonics technique (using two layers of speakers). 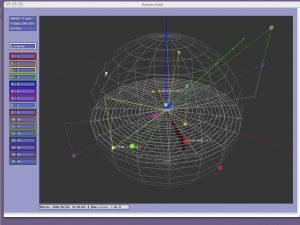 Plotting a soundscape using 3DAudioScape modelling software. While most concerts rely on banks of boxes to blast audio from the stage to the audience, 3D soundscapes are crafted via ‘spherical’ (more often cylindrical) arrays of speakers placed below, above and around the heads of the audience. 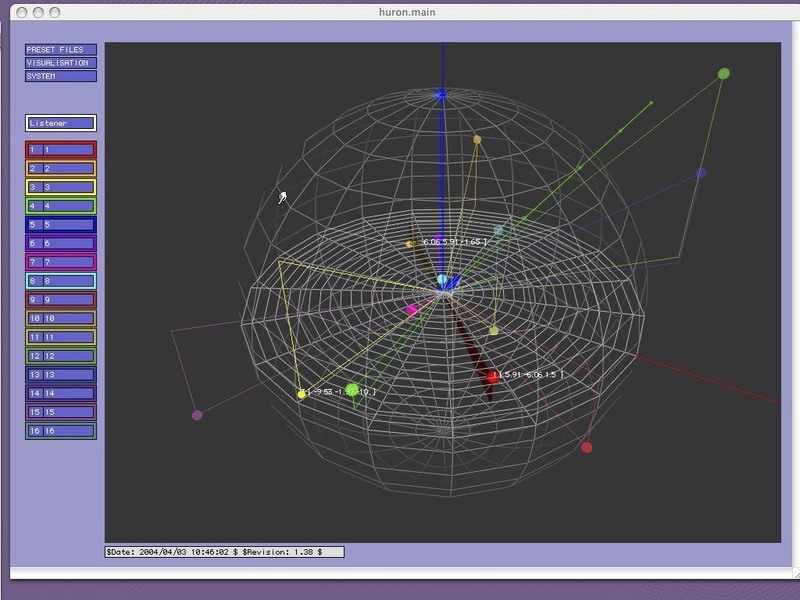 Mixing is done on screen, in a graphic display which shows locations and sonic links among the speakers. Channels can be programmed individually or in groups – and entire shows can be rehearsed with existing equipment in a recording studio. Not all Illustrious soundscapes are one-night wonders. The UK team has delivered repeating and permanent works to London’s Olympic Park, Wembley Stadium and Millennium Bridge, as well as West Street in Brighton and the world’s first permanent soundscape at a key intersection in Workington. Illustrious also produced the ‘world’s largest’ ‘Sound Oasis’, which cycled over 24 hours for 10 days at Palacio di Belles Artes, Mexico City, and was experienced by more than one million people. All of the company’s projects – including current discussions with the architects for Google’s new London headquarters – are informed by Illustrious’ quasi-monumental mission statement: ‘Building Dreams in Space’.